It has been 19 years since the release of M. Night Shyamalan's Unbreakable (2000). As the follow-up to his breakout hit, The Sixth Sense, the film was greeted by some at the time as a disappointment. The mind-blowing twist at the end of Sixth Sense set a high bar of expectations, and it wasn't long before Shyamalan became pigeon-holed for making feature-length "Twilight Zone" episodes that featured a shocking turn of events at their climax. Audiences expected to be shocked every time, spending more time trying to guess the twist than engaging with the story Shyamalan was trying to tell. Unbreakable's ending isn't so much a shocker as it is a complete reframing of the film we just watched. The now iconic twist at the end of The Sixth Sense served a similar purpose, but Unbreakable s is a much more subtle and yet seemingly inevitable turn of events. 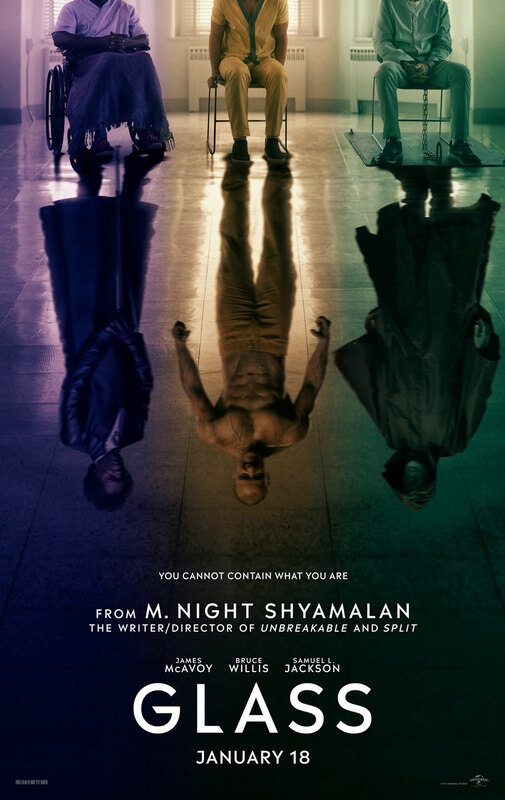 In the years since, the film has garnered quite a few fans, and in this critic's estimation, it is Shyamalan's finest work as a filmmaker to date. It's an elegantly crafted mystery that smartly deconstructs comic book mythology. So when the twist at the end of 2017's Split revealed that it was set in the same world as Unbreakable anticipation for a long-promised Unbreakable sequel hit an all-time high. Shyamalan has always said that he originally envisioned Unbreakable as the first part of a trilogy exploring superhero mythology. His latest film, Glass, is not exactly the film he promised all those years ago, but that's part of its appeal. The film picks up nearly 20 years after the events of the first film. David Dunn (Bruce Willis) now owns his own security business while moonlighting as "The Overseer," a cloaked vigilante who takes down petty criminals with the help of his son, Joseph (Spencer Treat Clark). Kevin Wendell Crumb (James McAvoy), aka "The Horde," is still on the loose, and has kidnapped a new group of young women. When a failed confrontation ends with both Crumb and Dunn in a mental institution with Mr. Glass (Samuel L. Jackson) under the treatment of one Dr. Staple (Sarah Paulson), the reality of their situation comes into question. Do they really possess superhuman abilities? It's point Mr. Glass is determined to prove to the world, and a dastardly plot to validate comic book mythology and reveal the superhumans to the world soon begins to take shape. Much like Unbreakable Glass constantly subverts audience expectations, denying us the climactic showdown it promises. The film turns left every time we expect it to turn right. Shyamalan has many faults as a filmmaker; he often ignores critical details that get in the way of his narrative, his writing often has an awkward, expository cadence, and yet there are few filmmakers working today as consistently interesting. Glass is not a great film, but it is a fascinating one. It's a sequel to a 20 year old drama about real life super heroes that is actively deconstructing its own mythology even as it's building it. In that regard it's often like a dog chasing its own tail, yet it clearly follows a familiar superhero trajectory while similarly undercutting audience expectations. Glass is not the elegantly crafted genre deconstruction that Unbreakable was. But you'll be hard pressed to find a mainstream filmmaker so boldly grappling with big ideas, even if his experiments don't always land. It's a messy, sometimes unwieldy film, yet one can't help but be enthralled by what Shyamalan is doing here. Just as composer West Dylan Thordson strips down James Newton Howard's original musical themes from Unbreakable, so too is Shyamalan stripping away the trappings of popular myth making to its barest essence, reframing the narrative and exploring the origins of superhumans through the lens of society's complicated reactions to the extraordinary. This is in no way the film we expected it to be - it seems strangely straightforward, anti-climactic, and meandering, and yet that seems like the most thematically appropriate way to honor the legacy of Unbreakable. 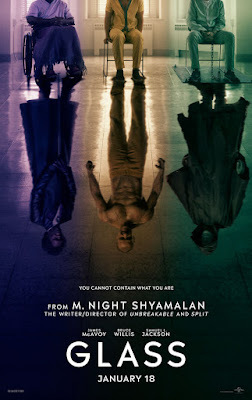 GLASS | Directed by M. Night Shyamalan | Stars James McAvoy, Bruce Willis, Samuel L. Jackson, Anya Taylor-Joy, Sarah Paulson, Spencer Treat Clark, Charlayne Woodard | Rated PG-13 for violence including some bloody images, thematic elements, and language | Now playing in theaters everywhere.